This graph shows how popular the four breeding sections were in 2014, based on the breeding section of the stallion. 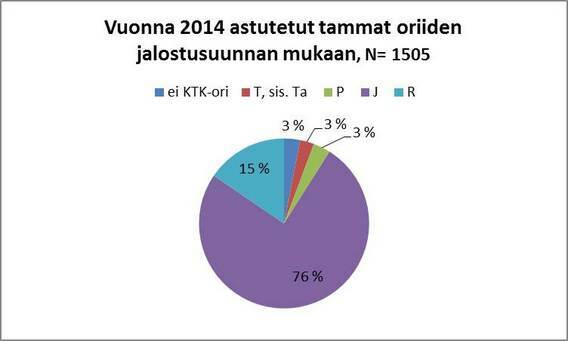 Altogether 1505 Finnhorse mares were covered in 2014. The most popular section was the trotter (J) section with 1137 mares, (75,5%), then riding horse (R) with 233 mares, which is 15,5% of all mares, work horses (T) got 40 (2,7%) and pony-sized finnhorse stallions (P) got 49 mares, which is 3,3% of all. Altogether 46 mares (3,1%) were taken to a stallion that hasn’t been shown and/or accepted to the studbook. These stallions represent a variety of breeding sections, but most often the owner either wants to use this stallion for his/her own mare(s), or has no interest in harness racing. These foals are registered as finnhorses, but unless the same owner owns both, the mare and the stallion, the foal doesn’t get to race in trotting races. Riding competitions, however, welcome everyone. See the list of full statistics here (altogether 188 stallions). Categories: Breeding & pedigrees | Tags: finnhorse, Horse breeding | Permalink.